If I was to pinpoint my favourite decade in cinema, it has to be the 70s. A time when Hollywood committees weren’t in charge and directors took over and made films that they wanted to see. The results were 10 years of some of the finest films around, from The Godfather to The Exorcist and Taxi Driver. In between all of these now classic films were small yet perfectly formed gem just like The Taking Of Pelham One Two Three, which not only was a gripping thriller but a terrific slice of entertainment, thanks to an inspired piece of casting and a director not bogged down by know-it-all Hollywood bigwigs. An ordinary day on the subways of New York when four men board the train from Pelham. Led by Mr Blue, they hijack the train and the passengers aboard the front carriage, demanding $1 million to be delivered in an hour otherwise they will kill a hostage every minute it is late. It is up to transit Police Lt. Zachary Garber to try and control the situation as well as working out the hijackers next step in order to capture them and save the passengers. The film kicks off in grand style. David Shire’s thumping, full orchestrated score that instantly gives you the feeling we are in for an exciting roller coaster of a ride. It captures the tone and mood of the film brilliantly. Then we are off, taking it’s time to introduce the main players, not rushing into the hijacking but building up the tension nicely. Director Joseph Sargent, who was never known as one of the big newcomers, mainly working in television (he went on to direct Jaws: The Revenge), handles the situation well, allowing his actors to show development, even the minor characters. Once the crime has been executed, then the film is off at full speed, whether it’s the problems of the local government deciding what to do, the in-fighting among the crooks, or the people within the Subway system not really understanding what is going on. All these elements could go astray from each other but instead of that, they build nicely, giving the film extra layers to work with. Every single character is fully rounded, right down to the minor parts; police officers, passengers, subway workers. No one is just there because they need people to fill the screen. Each one has an important part in the action and that is a credit to script writer Peter Stone. We might not know every detail about them but we know just enough to care. From the Mayor with his illness and that the New Yorkers hate him, to his aide pushing him to do something, not for the safety of the passengers but the votes he can win. The hostages, each one is given plenty for us to know who they are and why they are there. They are not just faceless extras and so we start to wonder which one will be killed if the kidnappers don’t get what they want. Now this all may sound rather heavy and serious. It’s not. There are unexpected moments of comedy and this is what separates this from other hijacking thrillers. It’s mainly due to the inspired casting of Walter Matthau as the cop in charge of dealing with the hijackers. As Police Lt. Zachary Garber, his doggy faced, dead-pan delivery almost encourages comedy. Not known for his more serious roles (although he wasn’t solely a comedy actor), he brings a sense of humanity to the role. He’s not a tough hard cop in the same veins of, say, Dirty Harry. He’s an ordinary guy working in a department where hardly anything happens. He not only has to cope with the criminals but the Subway staff, especially controller Denny Doyle, played with full grumpiness by James Broderick, who just wants his trains back and running. Matthau is the lynchpin of the whole film and it works magnificently. In the recent remake, Denzel Washington played the role but had to be flawed. Matthau doesn’t need that. He is just a regular guy doing a job that one day is extraordinary. Leading the bad guys is the cool, stiff-upper lip Robert Shaw. As a former mercenary, he is a cold-hearted man who doesn’t care about killing off the passengers if the city don’t pay. 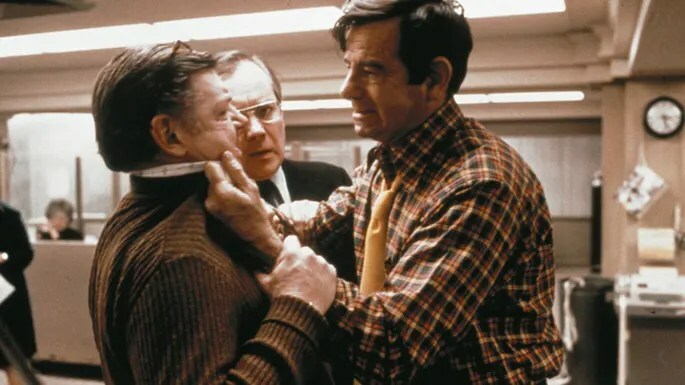 It is a terrific compliment to Matthau’s calm-headed cop. Add into the mix, Martin Balsam as the driver who nervously fears for his life, even though he knows he could reap the benefits if they succeed and Hector Elizondo as a “wise guy” thrown out of the Mafia for being out of control. As the film progresses and new dramatic arcs are added, it heads towards a finale that is both satisfying and also very funny and a better ending you couldn’t get, once again, thanks to Matthau. If you have only seen the remake with Washington and John Travolta, you are missing out on one of the finest thrillers of the 70s and it should be celebrated as to how enjoyable this film is. Quentin Tarantino was highly influenced by the film, using the colour names for his characters in Reservoir Dogs. So it can’t be that bad.